They are off and running in the three-day, 54-hole Aberdeen Senior Masters tournament at the Meldrum House Hotel Golf Course. 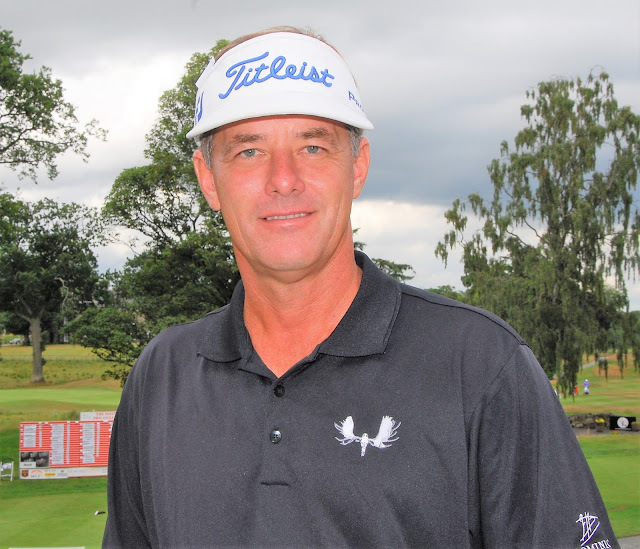 After a superb opening round, the odds were that American Dan Olsen, making his debut in the tournament on his first trip to Scotland, would lead at the end of the day and so it proved. On only his second outing over the course - the first was a practice round on Tuesday - Dan shot a seven-under-par 63. It cannot count for course record purposes as preferred lies were in operation but still a very, very good score. Dan comes from Ponte Vedra Beach, Florida and is highly regarded as a golf teacher, golf coach and a tournament player, now competing at senior level. "I played Royal Aberdeen on Monday and I thought it was a terrific links course, capable of staging the Open. But the Meldrum House Hotel course has a lot of charm and I think its bunkers have been brilliantly created, fashioned and positioned. Much better than you find on the majority of courses in Florida or even the USA." Take a bow, Meldrum House Hotel course designer Graeme Webster! "My short game was pretty good and I drove the ball well. When you put these together, you have the formula for reducing a course to 63 strokes," added Dan . He had a eagle 3 at the 11th, where he chipped in from off the green and he birdied the sixth, ninth, 13th, 14th, 16th and 17th. And he had one three-putt bogey, at the sixth. At the end of the day a total of 18 players had scored under the par of 70. 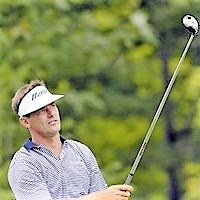 Aussie Glenn Joyner cut Olsen's lead to two strokes with a 65, his lowest ever tournament score by at least five strokes! Well done, Glenn (pictured right). Spain's Fernando Roca and Argentina's Cesar Monasterio, a winner on the European Tour in his younger days, share third place overnight with 66s. Sub-par Scots included Kenny Hutton (Downfield), Andrew Oldcorn (Kings Acre) and home-course amateur Nick Robson (boss of one of of the tournament-sponsoring companies, Thistle Windows), with 68s, and Craig Ronald (Carluke) with a 69. Robson, by the way, the current leading amateur in the tournament. Can he win that title once again? I wouldn't bet against him! Former winners of this tournament and in the mix again are Tim Spence and Miguel Martin, both with 67s and in joint fifth place. The field will be cut to the leading 50 players and ties at the end of Thursday's second round. First prize is £5,000 in the £30,000 tournament which is sponsored jointly by Thistle Windows, the Gymrental Co and Meldrum House Hotel. The field is made up of professionals aged 48 years and over plus Class 1 amateurs. 68 K Hutton, A Oldcorn, J C G Lopez, P Linhart, S McNally, N Robson (am), B Conser, R Gomez. 72 D Narveson, M Mankin, T Thelen, L Turner, B Rollison, I Roberts, J M Carrasco. 74 D Williamson, A Ross (am), G Emerson, V Casado, S Hill. 76 G Bolla (am), M Lang. 77 K Tenmark, N Mitchell. 82 M Ure, S Sherwood. NRs P Corsaletti, D McKenzie, G King, G Goldie, J P Sallat. Admission for spectators is free and there is no charge for car parking either.